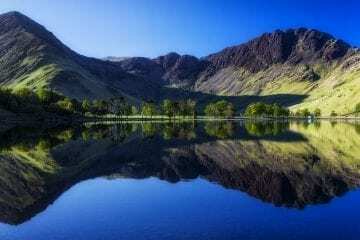 A great camping trip or a joyful RV vacation can be an amazing experience. 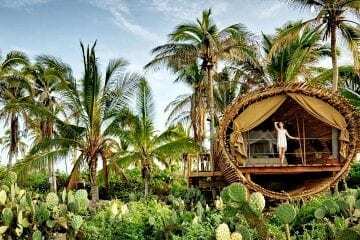 You enjoy the nature, as well as the people you are spending your time with, but you might be left without some of the things you are used to having virtually unlimited access to at home – electricity for instance. 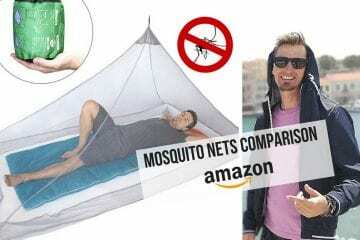 Of course, that’s exactly the reason why some people spend their weekends camping in the woods. 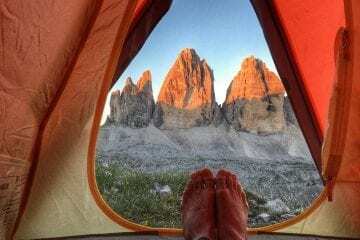 They want to get away from the rush of the modern world and reconnect with the nature, enjoying the great peace it can offer. Some people might enjoy spending a couple of days without electricity, but others can’t imagine spending even a mere one day without it. 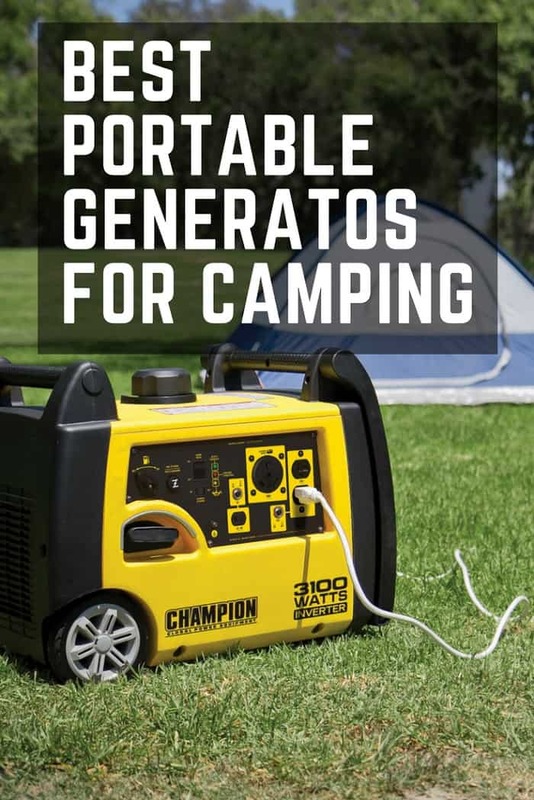 Luckily, there is a plethora of great portable generators you can take with you pretty much anywhere. 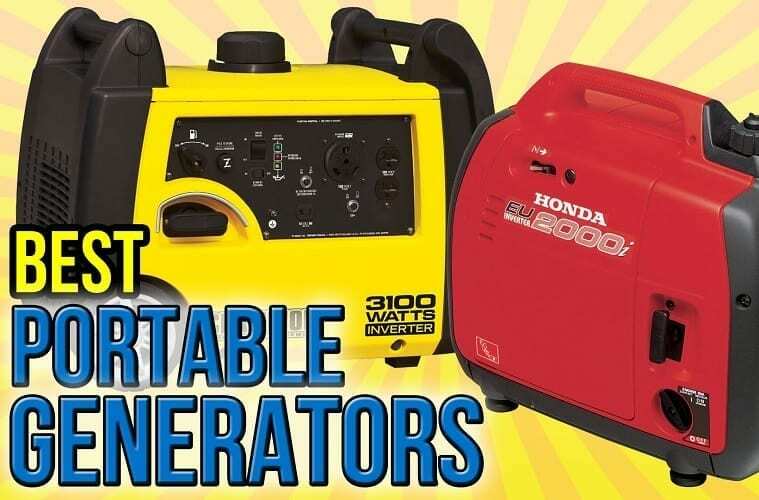 We handpicked 5 of the best portable generators, compared 4 of them side by side and compiled this list for you, so that you don’t have to spend countless hours browsing through online stores and make a difficult decision, picking one from many generators that might seem almost the same. Wen 56200i is a 4-stroke portable generator capable of providing 1600 running watts and 2000 starting (surge) watts of power. It’s extremely quiet with noise level rating of 51 dB, as well as reasonably light for a portable generator at 48 pounds or 22 kilograms. That being said, one of Wen 56200i’s main strength is connected to the value you get for your money. 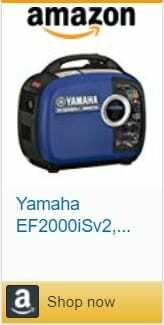 For example, when compared to Yamaha EF2000iSv2 mentioned later on in this list, the price you pay for this generator is a bargain. 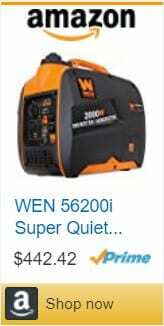 The Wen brand might not be as reputable as Yamaha or Honda, but hundreds of positive Amazon reviews can be considered clear evidence that Wen 56200i simply works well. It includes two regular electrical receptacles, as well as one 12V receptacle and one 5V USB port from which you can charge your USB-powered devices directly, so you just need a cable. 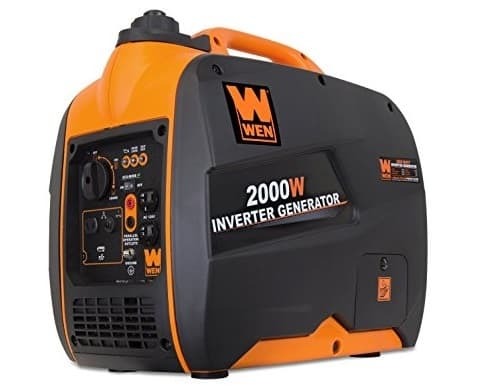 Wen 56200i has a fuel capacity of 1 gallon (3.8 liters), which seems to be somewhat of an average in the category of portable generators. It uses the fuel to produce “clean” power with low levels of distortion (3%), which means it shouldn’t cause any harm to your sensitive electronics and you don’t have to worry about what you use it to power or charge. 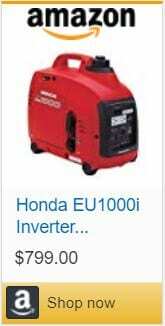 If you only need a smaller portable generator, Honda EU1000i is a great option. Is extremely portable at 32 pounds or 14.5 kilograms and it produces 900 running watts and 1000 surge watts of power. EU1000i’s main strengths lays in its portability. It’s a smaller inverter generator that produces less power than other options in this list, but is much lighter. 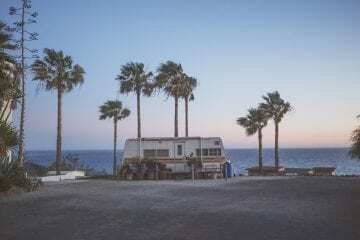 If you don’t need a lot of power and prefer a lighter load for your RV or camping trip, this generator might be the best option for you. Although it’s less powerful than Wen 56200i, it seems to be louder with noise levels at 59 dB. It also has a smaller fuel capacity of 0.6 gallons (2.3 liters), however, it lasts pretty long thanks to lower consumption caused by less electricity being produced. 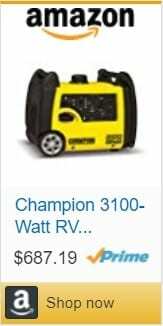 On the opposite side of the spectrum stays beefy 3100-watt generator by Champion with 3100 starting watts and 2800 running watts, which will provide more power than a regular RV or camping trip requires. 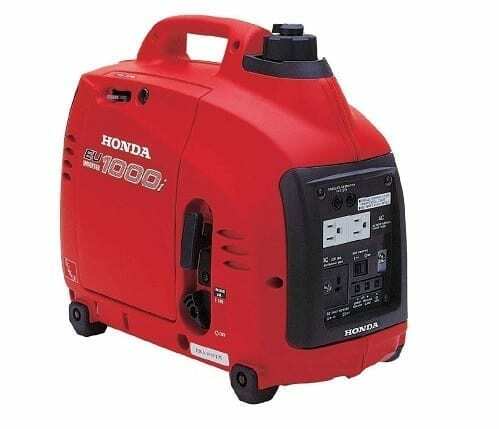 This portable inverter generator ships “RV Ready”, with a 120V 30A outlet used by recreational vehicles, as well as two “regular” 120V 20A household outlets and one 12V DC outlet. This selection should let you connect everything you might need directly into the generator, which is a great plus of this machine. Just as Wen 56200i, Champion also boasts about their 3100-watt generator producing “clean” power, with deviations under 3%, which makes it safe even for sensitive electronics. Another great thing about “the Champion” is how silent it is. Its noise levels are only at 58 dB, which is less than the aforementioned Honda capable of producing less than a third of Champion’s power capacity. What’s more, it has a great 1.6 gallon (6 liters) fuel capacity, which should last a long time without refueling. 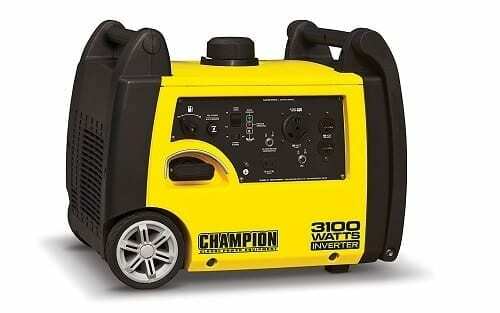 The only drawback of Champion 3100-Watt can be found in its weight of 95 pounds or 43 kilograms. However, higher weight can be expected given the 3100-Watt tag in its name. Yamaha EF2000iSv2 is in many ways similar to Wen 56200i. It also produces 2000 starting wats and 1600 running watts. It’s also quiet, with only 51 dB of noise when running on a quarter of the full capacity. Furthermore, Yamaha EF2000iSv2 is extremely eco-friendly. The machine’s “Smart Throttle” varies engine speed based on the current load, which improves fuel economy and reduces noise levels. It’s also CARB compliant, which means it can be used in California with the state’s strict restrictions against small power equipment engines. It’s lighter than its main competitor in this list (Wen 56200i) with 44 pounds or 20 kilograms and it has a bigger fuel capacity (1.1 gallons or 4.1 liters). It also produces extremely clean electricity with deviations smaller than 1%. Yamaha EF2000iSv2 has two 120V AC outlets and one 12V DC outlet for charging batteries. 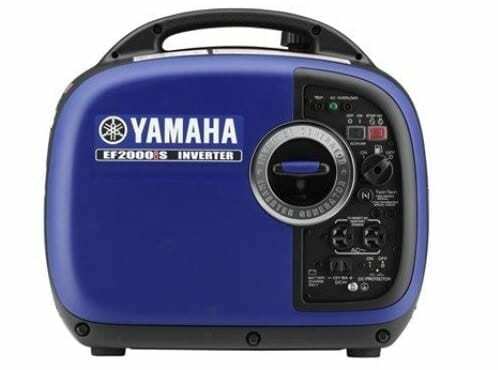 Yamaha EF2000iSv2 is undoubtedly a great portable generator, however, it’s also quite pricey. 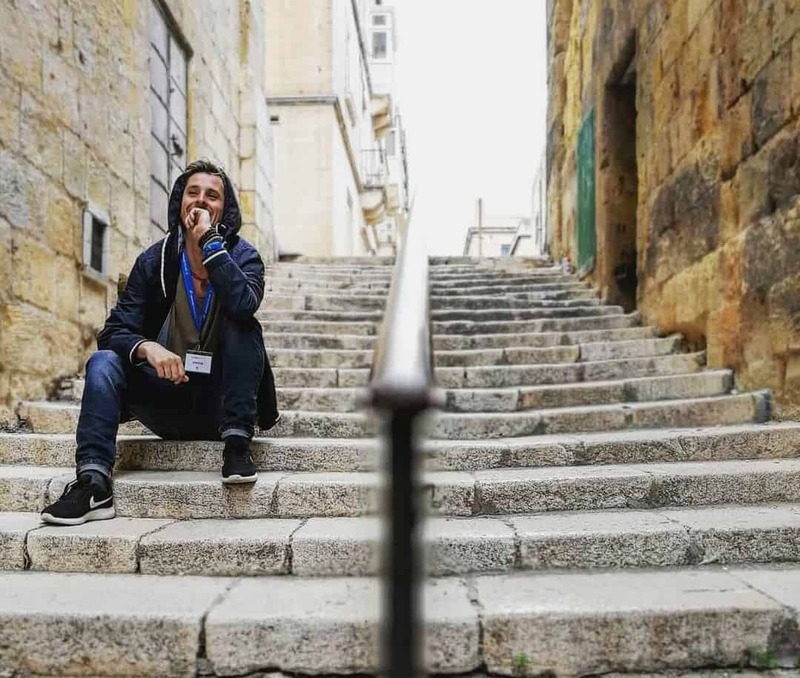 It’s up to you whether you want to spend a couple of hundred dollars more for its qualities and the big name of “Yamaha” or decide to go for something cheaper. 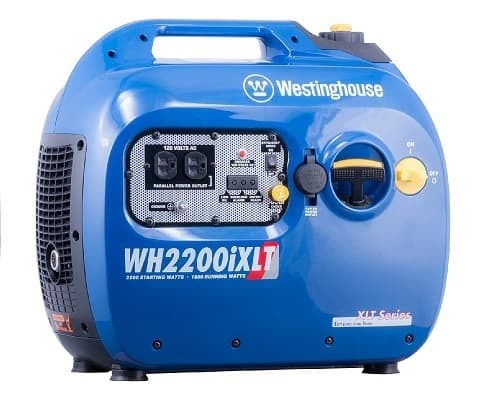 Westinghouse WH2200iXLT is a slightly more powerful generator than the Yamaha and Wen mentioned in this comparison. It has 2200 starting watts and 1800 running watts. With only 52 dB of noise output at 25% load it’s also extremely quiet and strong enough to run all of your essentials. What’s more, it’s even lighter than Yamaha EF2000iSv2 with only 43 pounds or 19.5 kilograms. It also produces “clean” electricity and is safe for sensitive electronics, has two 120V AC outlets and one 12V DC outlet and basically checks all the boxes for most people. The 1.3 gallons (almost 5 liters) of fuel capacity will go a long way with its efficient engine. The “Westinghouse” brand name might not be as well-known as Yamaha or Honda, but that doesn’t take away anything from the qualities of this generator. It’s a great option for people who like the 2000-watt zone but want a bit more just to be sure. 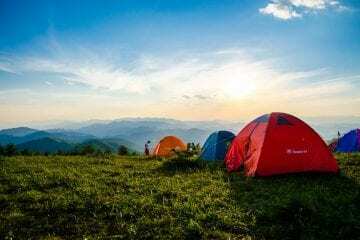 Having portable generator can move your camping experience to another level. On one side, you can enjoy more technology but it can “disconnect” your from nature a bit. 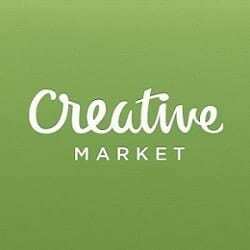 On the other side, you will become more independent and you will be able to spend more time in more remote areas where generators will become very handy! We highly suggest getting one of the best generators from above but make sure they don’t disconnect you from nature!